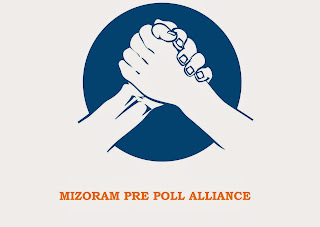 Aizawl, Oct 30 : The Mizo National Front (MNF), Mizoram People’s Conference (MPC) and Maraland Democratic Front (MDF) today entered into a pre-poll alliance for the state Assembly polls that are just 27 days away. According to the agreement reached between the three parties, the MNF will contest 31 seats, the MPC will contest eight seats and the MDF one. The seat-sharing formula was announced today at a news conference attended by MNF vice-president Tawnluia, MPC party executive general secretary Kenneth Chawngliana and the lone sitting MDF legislator P.P. Thawla. According to the seat-sharing arrangement, the MPC will contest from Aizawl North 1, Aizawl North II, Aizawl East I, Champhai South, Hrangturzo and Lunglei East constituencies. The MDF will get the constituency it already holds — Palak. The MNF will contest the rest of the seats with support from the MPC and MDF. The MNF, which is considered the “main” Opposition party in the state has to claw its way back after it was virtually wiped out by an anti-incumbency wave in the 2008 Assembly elections — managing to win only three seats. The wave swept the Congress party to power — giving it 31 seats. But the MNF got 30.6 per cent the total votes while the MPC got 10.38 per cent. The Congress, on the other hand, got 38.98 per cent of the total votes but won 80 per cent of the seats. So, leaders of the MNF, MPC and MDF probably figured that forming a coalition would give them a winning formula. The three-party front would release its joint manifesto shortly, Tawnluia said. The Zoram National Front (ZNP) that fared poorly in the last elections, getting only two seats, is still trying to work out its strategy for the coming elections. At the same time, a newcomer to the political scene, the Zoramthar Duhtute Pawl (ZDP), has already declared its intention to contest the Assembly polls but has not revealed from which constituencies it will contest. These two parties could sink the plans of the MNF-MDF-MPC trio. The Congress party leaders, including chief minister Lalthanhawla, are currently camped in New Delhi to get the stamp of approval for their list of candidates, party sources said.